The What: Atlona has unveiled the new OMEGA Series of switching, extension, and video processing solutions designed for presentation and collaboration. The What Else: Three products lead off the new OMEGA Series. The AT-OME-TX21-WP-E, now shipping, is a two-input, 4K EU/UK wallplate switcher and HDBaseT transmitter with one HDMI input, one USB-C input, and one HDBaseT output. 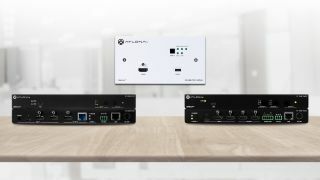 The space-efficient, PoE-powered unit offers a two-gang form factor and ships with interchangeable EU and UK trim kits, each in black or white, allowing discreet installation in European commercial AV environments. The OME-TX-WP-E is well suited as a core component of a small AV deployment or for providing AV connectivity in lecterns, floor boxes, and remote wall locations for larger-scale installations. The AT-OME-ST31, which begins shipping late October, is a global 3x1, 4K switcher and HDBaseT transmitter with two HDMI inputs, one USB-C input, and two mirrored outputs—one HDMI and one HDBaseT for transmitting video, embedded audio, and control signals up to 330 feet (100 meters) over category cable. Stereo analog audio embedding replaces the HDMI or USB-C input audio, allowing simple integration of sound from PCs or audio-only sources. The unit’s compact form factor facilitates inconspicuous integration with furniture in meeting rooms, auditoriums, and open presentation spaces, and when installed below a meeting table, Atlona’s Pocket 3H (AT-PKT-3H) cable access enclosure provides convenient tabletop connectivity. The AT-OME-SW32, which begins shipping early November, is a global 4K HDR, 3x2 matrix switcher featuring two HDMI inputs and one USB-C input, the latter enabling direct connectivity for laptops and mobile devices with AV-capable USB-C ports. The unit’s two HDMI outputs can be flexibly configured with a choice of three mirrored and matrix switching modes, while balanced analog audio output provides de-embedded stereo audio. Easily mounted under a conference table in smaller meeting spaces, the compact OME-SW32 is suited for serving dual displays, sub-switching into a central AV-over-IP system such as Atlona’s OmniStream platform, videoconferencing, and many other applications. The use of 4K video in AV applications continues to proliferate, and all three initial OMEGA models support 4K/UHD at 60Hz. All inputs and the HDMI outputs on the OME-SW32 and OME-ST31 support 4K HDR and 4K/60 with 4:4:4 chroma sampling at HDMI data rates up to 18Gbps, while the OME-TX-21-WP-E and the HDBaseT output of the OME-ST31 support 4K60 at 4:2:0. The OME-SW32 and OME-ST31 can also down-convert 4K inputs to 1080 on one HDMI output if desired, making them well suited for applications that combine 4K and HD sources and displays. For HDBaseT transport, the OME-ST-31 and OME-TX21-WP-E can be combined with Atlona’s AT-HDVS200-RX or AT-HDVS-SC-RX scaling receivers, AT-UHD-EX-100CE-RX-PSE receiver or HDBaseT-input switchers. All three models offer a wealth of integration and user-convenience features including automatic input selection and display control, HDCP 2.2 compliance, and TCP/IP and RS-232 control for integration with third-party control systems. Comprehensive and intuitive remote management of the OMEGA Series products is available through the Atlona Management System (AMS 2.0) and Atlona’s Velocity IP-based AV control platform. The Bottom Line:Designed for AV presentation and collaboration in modern institutions and meeting spaces, the new product family addresses continually evolving trends in how people gather to share information and facilitate productivity, as well as the ways in which they engage technology for communicating through AV content. The OME-TX-21-WP-E is available immediately, with the OME-ST-31 and OME-SW32 scheduled to follow within a month. All three models are backed by Atlona’s 10-year limited product warranty and customer support services.